These sweet potato fries are addictive. Healthy, too because they are cooked in the oven, not deep fried. 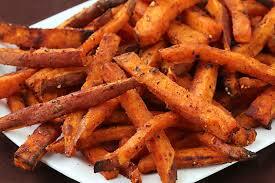 •	Wash and dry the sweet potato, peel, and chop into wedges. •	Add the cut sweet potatoes to a bowl with the rest of the ingredients. Toss everything together until the sweet potatoes are well coated. •	Place the sweet potatoes on a tray and cook for about 25-30 minutes.